I am behind on everything! With Michael gone I just can't keep up. The kids are alive and are fed infrequently, and that my friends, is as much as I can manage. Something that has gone out the window completely while Michael is gone is getting the kids to bed at a decent hour. You would think that I would be counting down the seconds until bedtime, but bedtime on my own is such a hassle that I keep putting it off and off and off. I did get the littles down by nine last night, but Isaac and Henry went to bed after eleven, and James was in bed by one. Yes, that is correct. 1:00 a.m.
Are you a single mother? Can I kiss your feet? And ask you how. the. hell. do. you. do it?!?! Michael should be home in 33 hours and 50 minutes. But whose counting? He'll be here in time to go Mass with us and then we can split up again for soccer. Last week I thought it would be a good thing to attend Saturday night because I figured it would be easier to get there since we were already up and everything. The church was only about 2/3's full, but Malcolm made sure those hundred people knew that we were there by randomly dropping large books, throwing his shoes, and repeatedly shrieking "NOOOOO!" as though someone was pulling his fingernails off. That was early in Michael's trip when I still had energy to make food and get the baby dressed, so at least I know he was full and looked cute! 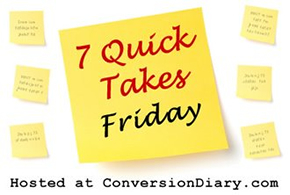 Go check out more Quick Takes over at Conversion Diary. You are so cute, Jessica!